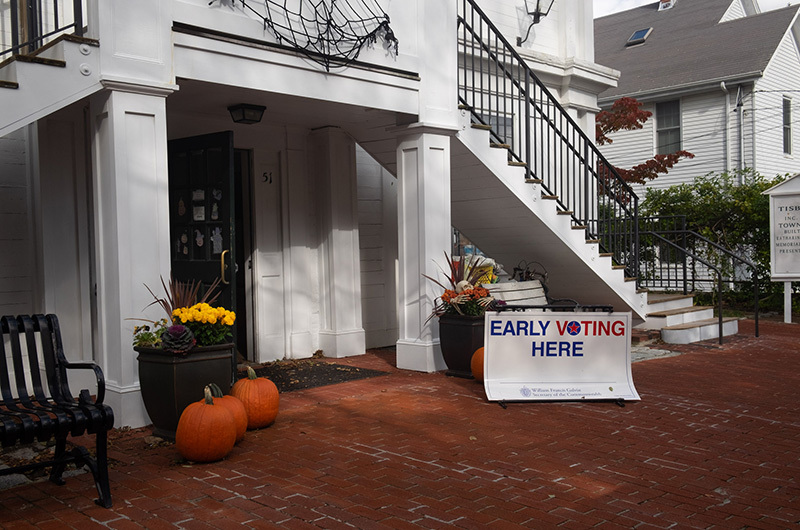 Vineyard voters will go to the polls Tuesday to cast ballots in the much-anticipated mid-term election, choosing the next Massachusetts Senator and U.S. Representative, the next clerk of superior court and state senator, among others. Voters will also face state ballot questions on nurse-patient ratios, rethinking campaign spending and gender identity as grounds for discrimination. Polls are open from 7 a.m. to 8 p.m. in every Island town. As town clerks gear up for election day, they report enthusiasm from early and absentee voters. Early voting began Oct. 22. Aquinnah town clerk Gabriella Camilleri said election day is a true community event in her town. Tisbury town clerk Hillary Conklin said between opening the polls and counting the ballots, she clocked 21 hours on primary election day. “This time I’m thinking it’ll be 22,” she said. Voters in Dukes County face an array of choices on local and national candidates and issues. Vineyarders will cast votes in two contested local elections on Tuesday. In the race for clerk of courts, Democratic attorney T. George Davis of Oak Bluffs and physician’s assistant Anthony Piland of Vineyard Haven, an unenrolled candidate, are in the running. The winner of that race will take over for superior court clerk Joseph E. Sollitto Jr., who is retiring after 42 years. Mr. Sollitto was given a special surprise tribute in the Edgartown courthouse Thursday afternoon. In the race for county commission, eight candidates are running for seven seats. Uncontested races dominate the local ballot. Nine at-large members of the Martha’s Vineyard Commission are up for reelection to two-year terms. All nine candidates currently serve on the commission. Incumbent Democrat Paulo C. DeOliveira of Edgartown is running unopposed for county register of deeds. Acting register of probate Daphne Devries of Edgartown is running to finish out the term of Elizabeth Herrmann, who retired in May 2017 before her six-year term was up. Ms. Devries is running unopposed in the general election after defeating Gail Barmakian in the September primary. Up-Island voters will see an uncontested race for the Up-Island regional district school committee. Three incumbents, Katherine DeVane, Robert Lionette, and Jeffrey (Skipper) Manter 3rd are seeking reelection, while Roxane Ackerman and Alexander Salop are running for seats vacated by Theresa Manning and Michael Marcus. For the Cape and Islands state senate, Democratic incumbent Sen. Julian Cyr of Truro is defending his seat against challenger Barnstable Republican and town councilor John Flores. Cape and Islands state Rep. Dylan Fernandes of Falmouth, a Democrat, is running unopposed. Vineyard voters will join their counterparts in Massachusetts to elect a U.S. Senator and Congressman for the next two years. Incumbent Democratic Sen. Elizabeth Warren of Cambridge is facing a challenge from Republican state Rep. Geoff Diehl of Whitman and unenrolled candidate Shiva Ayyadurai of Belmont. In the ninth district, incumbent Democratic Rep. Bill Keating of Bourne is being challenged by Republican Peter D. Tedeschi, a businessman from Marshfield. In the governor’s race, voters will choose between incumbent Republican Gov. Charlie Baker and Lieut. Gov. Karyn Polito and Democratic challenger Jay Gonzalez, who served as secretary of administration and finance under former Gov. Deval Patrick. His running mate is Quentin Palfrey. In the Massachusetts Attorney General race, Republican attorney James R. McMahon, 3rd of Bourne is challenging incumbent Attorney General Maura Healey. Incumbent Democratic Secretary of State William Francis Galvin is seeking a seventh term over challenger Anthony M. Amore, a Swampscott Republican. Juan Sanchez of Holyoke is running as the Green-Rainbow party candidate. In the race for state treasurer, voters will choose among Democratic incumbent Deborah B. Goldberg, Republican state house representative Keiko M. Orrall of Lakeville, and Green-Rainbow party candidate Jamie M. Guerin of Northampton. Democratic incumbent State Auditor Suzanne Bump has three challengers: Concord Republican Helen Brady, Beverly Libertarian Daniel Fishman, and Northampton Green-Rainbow party member Edward J. Stamas. Incumbent governor’s council member Joseph C. Ferreira of Somerset will face a challenge from Republican Thomas F. Keyes of Sandwich to represent the first district, which includes Barnstable, Bristol, Dukes, Nantucket and Plymouth counties. Governor’s council members are elected every two years and advise the governor on a variety of things including gubernatorial pardons and appointments. Longtime Cape and Islands district attorney Michael D. O’Keefe, a Republican from Sandwich, is running unopposed. Voters will also decide on three ballot questions. Question 1 asks whether hospitals and some other health care facilities should be required to adhere to certain patient to nurse ratios beginning on Jan. 1 of next year. A yes vote would support limiting the number of patients under a nurse’s care. A no vote would make no changes to the rules. Question 2 asks whether a 15-member statewide citizen commission should be formed to consider the impact of political spending in Massachusetts and come up with potential changes to the U.S. Constitution that would regulate campaign contributions. A yes vote supports the creation of the commission. Question 3 is a referendum on a law already in place. It asks whether voters approve of a law that passed in 2016 that adds gender identity to the list of prohibited grounds for discrimination in public places. The law protects people of all gender identities from discrimination in the same way people of all religions, nationalities, and races are protected. A yes vote keeps the law intact. A no vote would repeal the part of the law that protects people of all gender identities. Voters who need a ride to the polls in Tisbury can contact the town clerk’s office (508-696-4215) to arrange a ride with a volunteer. In Aquinnah, Ms. Camilleri said voters needing a ride to the polls should call the town hall (508-645-2300).